Google has given some nice touches to its search snippets ( search snippets are a few lines of text displayed below individual search results that gives us an idea of what the page is all about). The newly added features, which are basically anchor links, will help the user to dig out more relevant information from their search results and look out more specifically for what they want without clicking on the links and visiting the actual pages. Another feature that the search snippet will sport is the "Jump to" link. 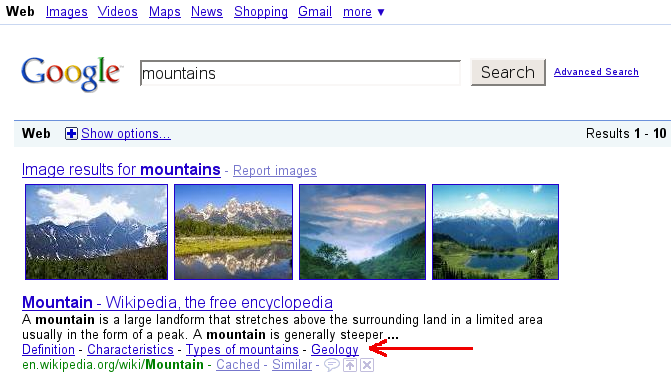 It will get displayed when your search query is more specific and is reflected in the search results. Clicking on this "Jump to" link will take you to that particular section of the website that is more specific to your search. For eg. if you search for 'good cholesterol level' the top most search result contains this 'Jump to' link that directs the user to the most relevant information on the page - "Your HDL (good) cholesterol level", which is more specific to the search query. One might ask that whether this is Google's take on Bing's more innovative 'more info' pop-up window (that gives you more information about whats there on that page) or not ? We don't think it is, as this is basically something which you can call 'search within search'. However at the end of the day, Bing still retains the "click-less-know-more" crown.